So again I find myself in the right place at the right time with the launch of the newest tome of nonfiction on Bombay entitled Maximum City: Bombay Lost and Found. It’s a book I read about in the September Vogue before leaving, so I was sure to go to the book reading and signing at the Kemps Corner branch of Crossword in Bombay. Judging from my first glance at the first chapter and from the readings at the event, I know I’m going to enjoy this book, even if it does mean investing some serious time in reading all 560 pages. 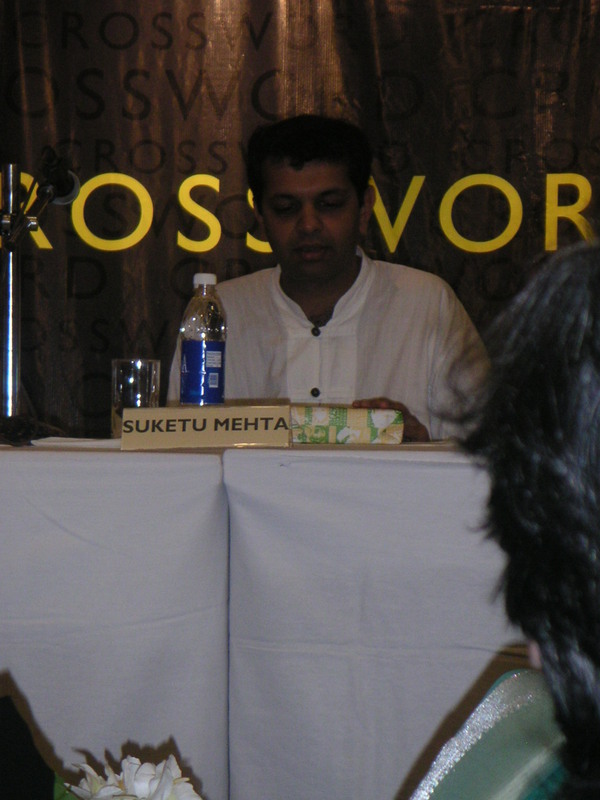 Suketu Mehta, the author, invited two actors to read passages from his book tonight. And, despite some uncomfortable moments caused by beeping cell phones and a rush hour traffic jam outside the thin windows, the readings went quite well. Kitu Gidwani and Rahul Bose did the honors. Some passages I enjoyed included the one on India being the “country of the ‘no’; the Powertoni chapter, which highlights the 1992-1993 Muslim-Hindu riots and was the original kernel for the book as an article in Granta; and a long chapter, not yet sure of the name, that looks at the Bombay underworld and the Hindi slang that goes with it. “Uska kam kiya,” for example, can mean “I killed him” or “I worked for him,” among other things. Looking forward to reading that passage closely. Mehta told the crowd of about 50-100 people (there are so many people in this city that my crowd number perspective is kind of warped) that it took him 2.5 years to research the book and 3 to 4 years to write. After a question from an audience member asking Mehta, whose family moved to New York City in 1977 and who returned only several years ago to live and do research, confessed that it is possible “to go home again,” but one must leave first to gain perspective. He likened “staying put” to a frog in a pot of boiling water: it notices changes, but only gradually. With that, I’m thinking that I may be writing more and more about Washington, Rome, and some other places that are long gone but still on my mind. In the meantime, I’ll be putting together some more tales about Ganesha – great pics are on the way!